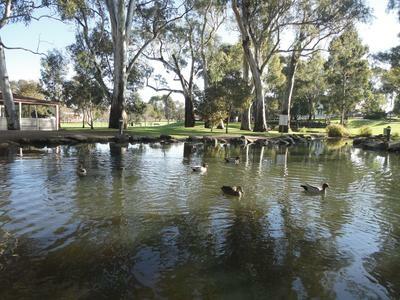 Civic Park in Modbury is located on North East Road and is about 30 minutes out of Adelaide. The park is directly across the street from Westfield Tea Tree Plaza and it can be a bit of a haven for anyone who has been dragged kicking and screaming to the shops and wishes they hadn't been (like my 19 month old son). 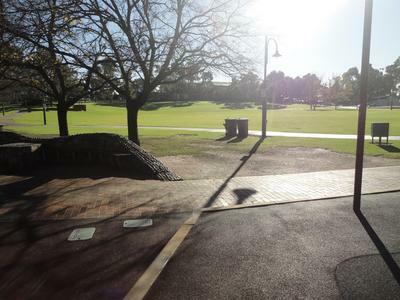 The park is really well kept with a grassed area that is huge and attracts lots of birds which the kids can feed if they are feeling generous or chase if they think that will be more fun. 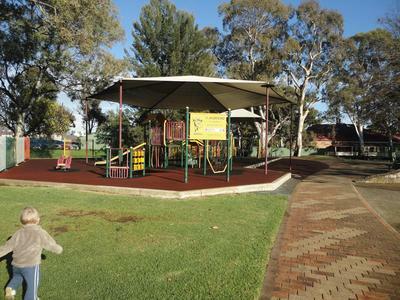 Civic Park has a playground that is well equipped with lots to climb on, fall off, slide down and swing on. It is a park that probably suits slightly older kids but there is a swing for babies and even better than that, there is a pond with lots of ducks that the kids can feed. The playground equipment is also well shaded and there is plenty of seating right next to it so if you are lucky enough to be able to put your feet up for a few minutes while the kids play, you can. The large grassed area is perfect for a picnic or even for someone just wanting to read the paper outside on a nice sunny day. There might be a bit of noise from the road but the park is big enough that you will definitely have plenty of space to yourself. Also nearby is a restaurant, the library and the park has its own toilet block. It is a great place to stop and either give the kids some time to play outside or even just to take a break yourself. Civic Park is really well located being right on the main road but, the playground is far enough back from the road that the kids are safe. We love having a park where you can play on the swings and feed the ducks in one spot. We often do our groceries at the plaza and then go across and give the ducks some of our fresh bread. Those lucky, lucky ducks.